This year I am speaking at a high-quality event organized by Netcomm Suisse in Swtizerland. 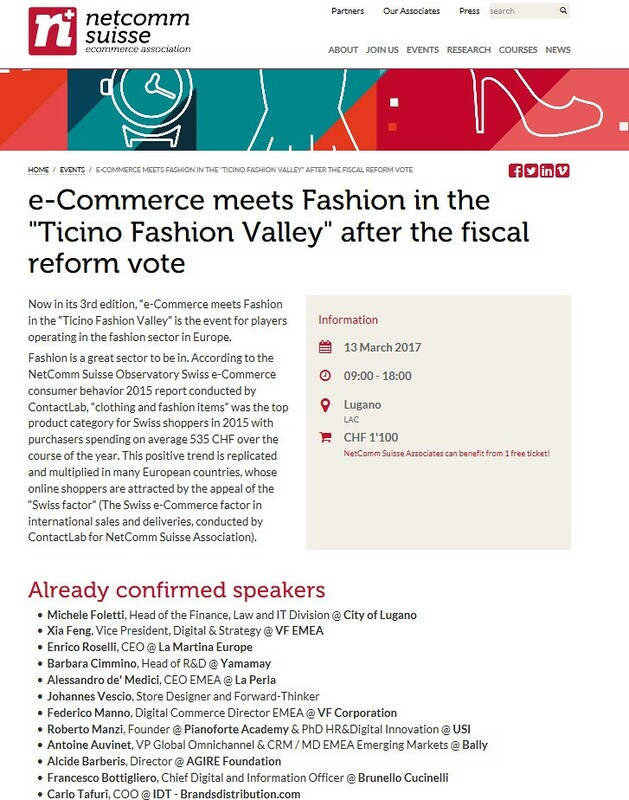 On Monday March 13th, 2017 the third edition of the international event “e-Commerce meets Fashion 2017” in the Ticino Fashion Valley of Switzerland will take place. This is the event for players operating in the fashion sector in Europe. Last year in February I spoke at the Swiss event: “e-Commerce and Digital meet Luxury Watches” organized by the national ecommerce association Netcomm Suisse. This was not just a lot of fun, but very professional and meaningful. It was meaningful in several facets: very high quality of subjects discussed, exclusive guests and relevant to the topics and superb location & organizxation/execution. Although this is thrid edition of the eCommerce Meets Fashion event organised by the Swiss eCommerce Association, this is the first time attending. And, I am honored to have been asked to speak during this event as well. I will speak about omni-channel retail in the luxury industry. During this event I will have the honor to share other professionals operating in both the luxury industry and tech world. Executives working at leading companies like: La Perla, Brunello Cuinelli, Merck, Bally, and many more. I am really excited and hope to meet you in person as one of the 650 visitors in Lugano, Switzerland. Pre-order your tickets via worht CHF 1.100 via the official website: Netcomm Suisse Site.